Online Banking link and menu. Press enter to navigate to this link. Press control + space to open submenu. To move through submenu items press tab and then press up or down arrow. Cash Management link and menu. Press enter to navigate to this link. Press control + space to open submenu. To move through submenu items press tab and then press up or down arrow. Payroll link and menu. Press enter to navigate to this link. Press control + space to open submenu. To move through submenu items press tab and then press up or down arrow. Mobile Banking link and menu. Press enter to navigate to this link. Press control + space to open submenu. To move through submenu items press tab and then press up or down arrow. Double-check the balance on your accounts right before you take your sales team to lunch, set off on an emergency supply run, or when you’re making a transfer or paying bills. Your account information is there when you want it. Access your accounts via an app developed specifically for your iPhone®, Windows® phone, iPod touch®, Android™ phone, iPad® or Android™ tablet. Mobile account access is available in our Mobile Banking App. Get the app layer It’s also available with Text Banking and on our Mobile Website. Our mobile app gives you more Mobile Banking options and features while Text Banking is the fastest way to get your account balances and recent transaction history from any mobile phone, without signing in. Use either depending on your time and need. Make transfers via an app developed specifically for your iPhone, iPod touch, Android phone, Windows phone, iPad or Android tablet. Mobile transfers are also available on our Mobile Website. We offer remote deposit options for your business that allow you to bank where you want and on your schedule, not ours. Say you’re visiting with a client and the client hands you a check. With Mobile Check Deposit, you can use select devices to simply snap pictures of the check, choose your account, enter the amount and send. After the deposit has been processed and posted to your account, you’ll see the check images displayed with the deposit transaction item in Mobile Banking and Small Business Online Banking. In Small Business Online Banking, just click on the images and you’ll be able to print copies for your records. Your check images are stored only at the bank, not on your device. Make deposits via an app developed specifically and exclusively for your iPhone, iPod touch, Android phone, Windows phone, iPad or Android tablet. Millions of customers rely on our proven privacy and security. Our fraud prevention and security systems protect you with the latest encryption technology. Our app requires you to sign in the same way you do with Small Business Online Banking. We do not allow your Passcode or any account information to be stored on your device. As additional security, you can use SafePass. Security is our priority no matter how you choose to bank with us. No stamps, no envelopes, no worries. On a business trip or long-awaited vacation, paying your bills is easy with Bill Pay. Choose the amount and when to pay. You can pay a bill to a company or individual once or plan recurring payments, schedule it a few days from now or next month if you like. With Bank of America, your payments are paid to your designated Pay To accounts on dates you choose in Bill Pay and for the dollar amounts you specify. To take advantage of this feature on your mobile device, be sure you’ve first set up the Pay To accounts you want in Small Business Online Banking. Get your bills online from any company participating in eBills (there are thousands). If you’re not already receiving eBills, first set up eBills in Small Business Online Banking. Once you have payees and eBills in your Small Business Online Banking account, you can easily pay your bills using Mobile Banking. Your online payment history confirms whom you paid, the date and the amount. 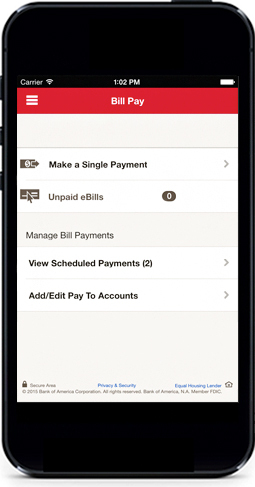 Your payments are now on time, wherever you are. Use Bill Pay via an app developed specifically for your iPhone, iPod touch, Android phone, Windows phone, iPad or Android tablet. Mobile Bill Pay is also available on our Mobile Website. Whether you’re at the airport, in the warehouse or on a loading dock, you can rely on alerts to inform you of changes and updates to your account. When you set up Mobile App Alerts, you’ll receive the account information you care about as push notifications on your iPhone, iPod touch, iPad, Android phone, Windows phone and Android tablet. You can also get BankAmeriDeals™ alerts when new cash back deals are available or about to expire. Help prevent late fees and overdraft fees by knowing when your business checking account balance drops below an amount you set or when an eBill is due but no payment is scheduled yet. Best of all, you can take immediate action, like using the Make transfer link in the low balance alert. You can also set alerts for irregular account activity or changes to your Small Business Online Banking profile. Get alerts via an app developed specifically and exclusively for your iPhone, iPod touch, Android phone, Windows phone, iPad or Android tablet. You can also set up Online Banking Alerts to get the same information sent as email and text messages. 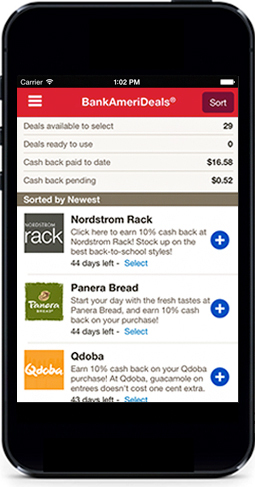 When you’re out replenishing inventory or having lunch, check BankAmeriDeals™ on your device and see if you can earn cash back. BankAmeriDeals™ retail and restaurant cash back deals can be selected on your compatible device. The deals you select are added automatically to your eligible debit cards. Pay for your purchases with your eligible Bank of America cards. When you swipe your card, your cash back is automatically calculated and credited to your business checking account on a monthly basis. Enjoy BankAmeriDeals™ via an app developed specifically and exclusively for your iPhone, iPod touch, Android phone, Windows phone, iPad or Android tablet. Offers shown for illustrative purposes only. Participating merchants may vary. Traveling in an unfamiliar city is a lot less stressful when you know exactly where to find your bank, especially if you need something extra like a 24-hour or Talking ATM or a banking center open on Saturday. 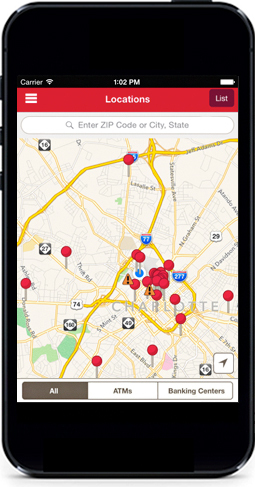 Find locations via an app developed specifically for your iPhone, iPod touch, Android phone, Windows phone, iPad or Android tablet. The Locations feature (without the capability to detect nearest location) is also available on our Mobile Website. 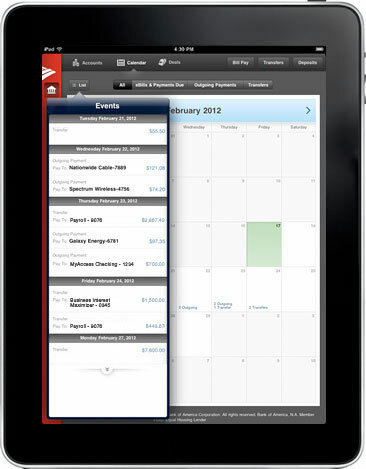 The calendar—available on the iPad and Android tablet—is the fastest way to view, check and manage your outgoing payments and transfers each month. A quick glance shows you the eBills, outgoing payments and Scheduled Transfers you’re expecting for each month so you have even more control over your business accounts. Make changes to any payments or transfers directly in the calendar. Select a date to pay a bill or schedule a transfer, change a date or cancel a payment. Please use exactly 10 numbers. We were unable to process your request. You can try again or use your mobile device to get the app from your device’s app store. We allow up to 3 text message attempts in 24 hours. You can try again later or use your mobile phone to get the app from your device’s app store instead. Get information about your Small Business checking, savings and credit card accounts within seconds. To enroll in Text Banking, sign in to Small Business Online Banking or call 1.800.604.9961 (you don’t need to be enrolled in Small Business Online Banking to use Text Banking). 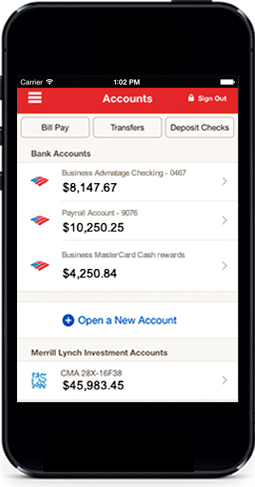 Visit bankofamerica.com from your mobile phone web browser. SafePass is Bank of America’s strongest protection against Mobile and Online Banking fraud and identity theft. This additional layer of security lets you authorize transactions using one-time, 6-digit Passcodes sent by text message directly to your mobile phone or tablet. With Mobile Check Deposit (available on most of our Mobile Banking Apps) and Small Business Remote Deposit Online service, you can use the options that make the most sense for your business. 1. Terms and conditions apply to the Mobile Check Deposit service. 2. If your Bank of America business checking or savings account has been open for less than 4 months, the Mobile Check Deposit monthly limit is $3,000. 3. 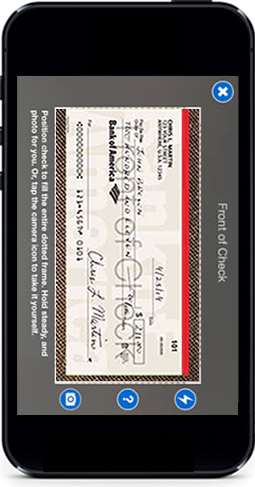 Mobile Check Deposit is available on the mobile app for iPhone®, iPod touch®, Android™ phone, Windows® Phone, iPad® and Android™ tablet. 4. Remote Deposit Online is subject to approval and availability in your area. 5. Transaction fees associated with your checking account still apply. Please refer to your deposit agreement. 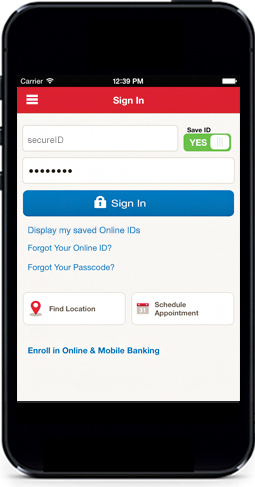 Mobile Banking requires enrollment through the Mobile Banking app, Mobile website or Online Banking. Enrollment through the Mobile Banking app is not available on all devices. View the Online Banking Service Agreement for more information. Data connection required. Wireless carrier fees may apply. 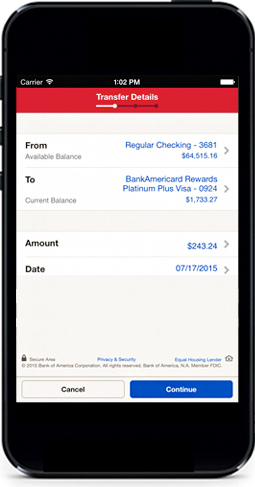 The Mobile Banking app is available on iPad, iPhone, Android and Windows 10 (except Xbox) devices. 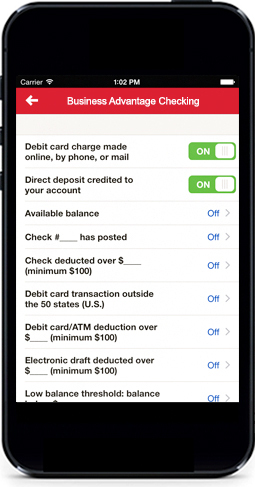 Not all Mobile Banking app features are available on all devices. Mobile Check Deposits are subject to verification and not available for immediate withdrawal. In the Mobile Banking app, select Help & Support, then Mobile Check Deposit for details, including funds availability, deposit limits, proper disposal of checks, restrictions and terms and conditions. Requires at least a 2-megapixel camera. Data connection required. Wireless carrier fees may apply. Email and mobile transfers require enrollment in the service and must be made from a Bank of America consumer checking or savings account to a domestic bank account. Recipients have 14 days to register to receive money or the transfer will be cancelled. Dollar and frequency limits apply. See the Online Banking Service Agreement for details, including cut-off and delivery times. Data connection required. Wireless carrier charges may apply. Mobile Banking app alerts are not available on the Mobile website. Data connection required. Wireless carrier fees may apply. ?Before using Bill Pay in Mobile Banking, you will need to first enroll in the service through Online Banking. Alerts received as text messages on your mobile access device may incur a charge from your mobile access service provider. This feature is not available on the Mobile website. Wireless carrier fees may apply. Fees apply to wires and certain transfers. See the Online Banking Service Agreement for details. Data connection required for online and mobile transfers. Wireless carrier fees may apply. Apple, the Apple logo, iPhone and iPad are trademarks of Apple Inc., registered in the U.S. and other countries. App Store is a service mark of Apple Inc. Android is a trademark of Google Inc. Bank of America and the Bank of America logo are registered trademarks of the Bank of America Corporation.